At an investors conference sponsored by Barclays Capital, Motorola (NASDAQ:MOT) co-CEO Sanjay Jha provided several strong hints that Motorola is poised to release a 7-10 inch Android tablet sometime soon. During a question-and-answer session, Jha discussed a "companion product" to a TV that would sport a 7-10 inch screen and that would allow users to walk around their house and watch TV. "We're very focused on participating in this convergence between mobility and home, and I actually think you will see some products from us in a very short period of time," he said, without providing details. However, Jha indicated Android would be a suitable operating system for such a product. That Motorola is eyeing tablets comes as no surprise, considering the dramatic success of Apple's (NASDAQ:AAPL) iPad. 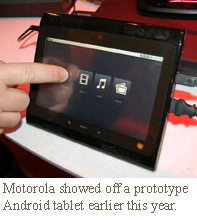 Indeed, Motorola showed off a prototype Android tablet earlier this year as part of a demonstration of Verizon Wireless' (NYSE:VZ) forthcoming LTE network. Further, according to the Wall Street Journal, Android is powering tablet efforts from the like of Dell, Acer and Asustek. During his appearance at the conference, Jha also commented on a range of issues facing Motorola, including the company's support for Google's Android platform, its MotoBLUR user interface and the company's position at Verizon, the nation's largest wireless carrier. "Nearly all of my focus is on Android today," Jha said, noting that Motorola has no serious plans to design its own, competing operating system. However, Jha explained that Android licensees must differentiate their products in order to succeed. He pointed to Motorola's effort to set itself apart from the rest of the market's Android players--the company's MotoBLUR user interface overlay--as an example of a winning strategy. Indeed, Jha said Motorola now counts more than 1 million users of its MotoBLUR service, and added that the company plans to release version 2.0 of its MotoBLUR offering sometime later this year. Though Jha said the forthcoming version of MotoBLUR would offer new services, he did not provide details. Interestingly, Jha said the operating system is not the only thing that's important in a phone. "OS alone is not what consumers choose a phone on," Jha said, explaining that 30-40 percent of Americans choose a phone on the feel and look of the device. He said in other countries, the look and feel of a device is an even more important factor among mobile phone shoppers. 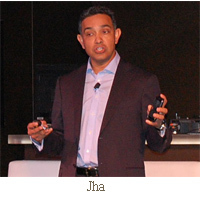 Finally, Jha addressed concerns that newer Droid products at Verizon, such as the HTC Incredible, would cut into sales of Motorola's Droid phone. "I think we're very well positioned [at Verizon]. We will introduce new Droid products in the Verizon franchise." Jha added: "I know the devices we are going to introduce, and that gives me comfort." So when can the market expect new Motorola products at Verizon? According to the WSJ, Verizon will launch two new Motorola smartphones in July, and will heavily promote the products. Verizon spent fully $100 million promoting the original Motorola Droid.